certificate 6.we have exported about 1000FCL to America,Russian,Middle East Asia and Africa Market 7.we always supply the high quality with lreasonable price for overseas market order. delicious 5.Our company stresses on quality management and always upholds the mind of "Quality First, Credibility First,Client First " to win trust among the customers. we have more than 10 years'experience production of canned foods If you have any questions ,pls don't hesitate to contact me. Made In China Canned Pineapple Fresh Fruit In Syrup 1 Product: Pineapple Juice Concentrate 2 PIN: MG0001 3 Production technology: The adoption of the current international advanced production equipment and processing technology to the Eropean Union AIJN and U.S. 4 Production Process: 5 Pineapple material Base: Based on the establishment of Hainan planting base to ensure an adequate supply of raw materials and good quality, the quality of the final product provides a strong guarantee. 6 Package: (1) 200Kg/Drum, inner aseptic bags, (2) 30Kg/Carton, inner aseptic bags (3) According to customer requirements 7 Storage conditions: Moisture, Clean and Pollution-free 8 Transportation Conditions: Narmal temperature transport, Without any means of transport, There are measures to prevent rain& sun. : 425G/246G 425gx24tins, 1730ctns/20fcl N/D.W. : 567G/329G 567gx24tins, 1360ctns/20fcl N/D.W. : 850G/493G 850gx24tins, 900ctns/20fcl N/D.W. 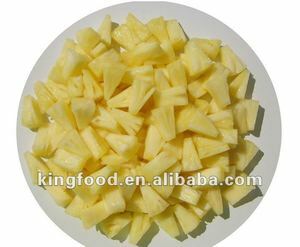 Alibaba.com offers 3,431 canned pineapples in syrup products. About 88% of these are canned fruit, 4% are fruit & vegetable juice, and 1% are canned vegetables. 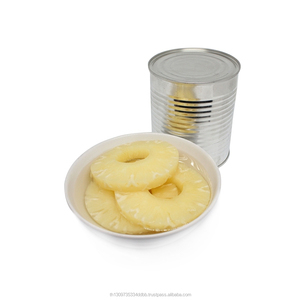 A wide variety of canned pineapples in syrup options are available to you, such as pineapple, pear, and apple. You can also choose from canned, dried, and fresh. As well as from syrup, water, and brine. And whether canned pineapples in syrup is free samples, or paid samples. 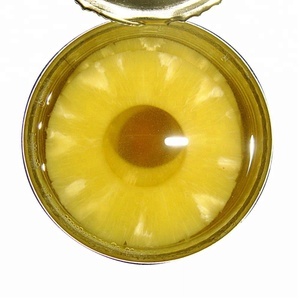 There are 3,108 canned pineapples in syrup suppliers, mainly located in Asia. The top supplying countries are China (Mainland), Vietnam, and Thailand, which supply 54%, 21%, and 12% of canned pineapples in syrup respectively. 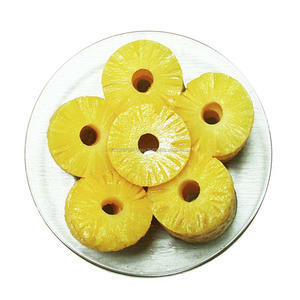 Canned pineapples in syrup products are most popular in Eastern Europe, North America, and Western Europe. You can ensure product safety by selecting from certified suppliers, including 1,565 with Other, 1,176 with HACCP, and 493 with ISO22000 certification.